Spook's creepy style begins with the ghoulish colors. Then comes the roughened, corroded background. Then add the swirly Transylvanian style borders. Drop in a spider or bat or skull & crossbones, and finish with a creepy letter style. Now you have a most discomfiting design to set your guests to expect just about anything at your spooky Halloween party. Customize your Spook halloween coasters today! Spook Halloween coasters come in in several shapes—3.9" round, 3.9" square with rounded corners, and others. They are extra-thick, 58-point paper board. To provide an idea of how thick they are, a stack of a dozen coasters is around 3/4" tall. They are made of absorbent pulpboard to help protect your surfaces. 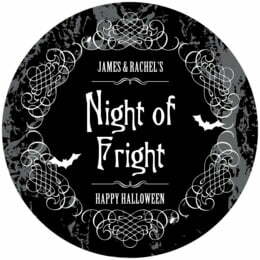 The top of the Halloween coasters is coated with a smooth matte coating to provide beautiful, crisp printing. Each coaster is die-cut, so their top has a soft and rounded edge. 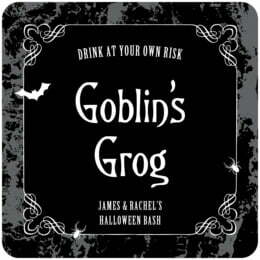 Halloween coasters are designed to be disposable, but they are durable and re-usable. If unused, they can be kept for keepsakes and will keep forever. You can also add a photo of a special person or people, in costume if you can set it up, to make your Halloween coasters ultra personalized. Coasters are printed on one side only, and on the blank back, a small Evermine logo is debossed. Halloween Coasters come beautifully packaged in boxed sets of a dozen. Choose a desired shape and color, and then select the "Personalize" button to start customizing your Spook Halloween coasters today!